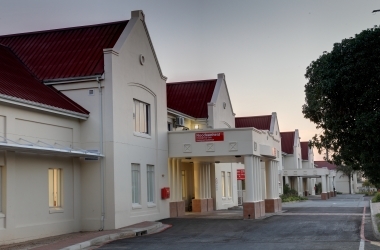 George Regional Hospital receives referrals from district hospitals and primary health care services. The hospital supports district hospitals in rural and outlying sub-districts, where they consult referred patients and train medical officers and professional nurses. Patient visiting hours (Monday to Sunday) are from 15:00 to 16:00. Evening visits are between 19:00 and 20:00. Visits on public holidays are from 15:00 to 16:30. Evening visits remain unchanged between 19:00 and 20:00. Corner of Langenhoven Road and Davidson Road, George, Western Cape. For hospital reception, call 044 874 5122 or 044 802 4528.